The J & S Carousel is a full-size antique carousel located in Davenport Park in St. Augustine, just north of the historic district. Kids love riding the painted horses (and one camel) as they go up and down while the carousel turns and the calliope music plays. Children and adults are welcome to hop aboard for $1.00 a ride. The carousel is open seven days a week from 10 a.m. to 9 p.m.
Davenport Park is located between San Marco Avenue and U.S. 1 on San Carlos Avenue, next to the Public Library building. The park includes a playground, with swings, monkey bars, slides (both open and closed), and a handicapped-accessible play structure. Originally called the C.W. Parker Carousel and built in 1927, the carousel was later purchased by a Ringling Brothers circus performer for $25,000. The carousel then went from a barn in Mystique, Michigan, to a children's zoo in Fort Wayne, Indiana. 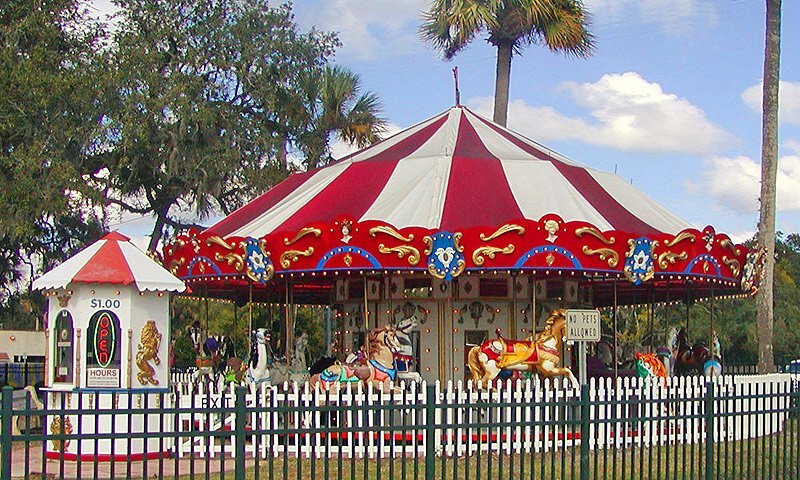 In 1992, the carousel was restored by James Soules and Carl Theel, and it was brought to Davenport Park here in St. Augustine in 1994. Renamed the J & S Carousel, it has been delighting children and adults -- both residents and visitors -- ever since. I went today with my son for first time and really enjoyed it this is awesome. My son loved it. we just love this merry go round. Bring back memories of our childhood. My husband and I are so happy to know it is open year round and who can beat a dollar a ride. Took our granddaughter to the carousel and park as part of a visit to St. Augustine. At 2 1/2 she absolutely loved multiple rides over the two days of our visit. Her grandpa greatly enjoyed the present memories of the ride with our granddaughter which brought back a lot of childhood memories of carousel rides in Indiana. She also enjoyed the other activities at the park. Three generations had a lot of fun. It topped off a great weekend in St. Augustine. We have visited St Augustine just to take our guests with children to this carousel. For a $1.00 a ride the children can ride it several times and you still have to drag them away. Also the park has swings and playground equipment and picnic benches. It's great!